Last month I joined a meet-up for a trek around the Jamaica Bay area. The first part of our walk was in Dead Horse Bay, a small body of water in Brooklyn managed by the National Park Service as part of the Gateway National Recreation Area. 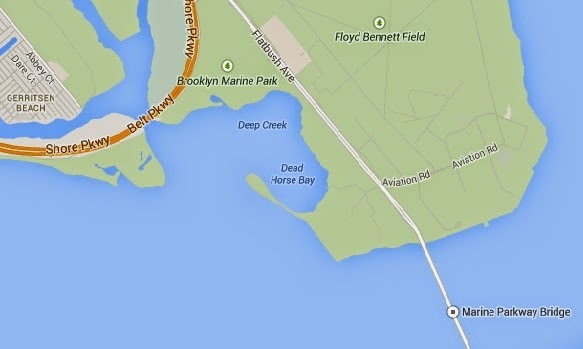 How did Dead Horse Bay got its name? The land sits at the western edge of a marshland once dotted by more than two dozen horse-rendering plants, fish oil factories and garbage incinerators. From the 1850's until the 1930's, the carcasses of dead horses and other animals from New York City streets were used to manufacture such items as glue and fertilizer. Once parts of the horses were removed, boiled and chopped up, they were simply dumped into the water. As the automobile grew in popularity, the number of horse carcasses in Dead Horse Bay dwindled but then city began dumping its garbage in the area. This landfill was capped after the refuse of the 1920's and 1930's filled the marsh. In the 1950's, the cap burst, spewing the artifacts of a different era onto the beach. Now glass bottles, shoe leather, plastic toys, old bones and handguns lie along the shoreline. We took the Q35 bus from Flatbush, got off at the Gateway Sports stop, and from there walked about a mile to the nearly hidden entrance of the trail. Trees and plants abound but the pathway is clear. We took the left most fork in the trail and at the end were rewarded with this beautiful sight. Stepping out of the vegetation, the view was even more gorgeous! But let not the view fool you! The beach is littered with thousands of broken bottle pieces, some plastic containers and even abandoned boats. That bridge above is the Marine Parkway-Gil Hodges Memorial Bridge that connects Marine Park, Flatbush Avenue and Floyd Bennett Field in Brooklyn with the Rockaway peninsula in Queens. Walking along the shore I nearly stumbled on something you'd hardly ever see in the city -- a horseshoe crab! There was also a part in the area where some sea grass grow, I was a little surprised to see it. Further to this grassy part is an area full of rocks ..
.. and of course, some trash. The place may have been a garbage dump before but looking up from that rocky area, the sky that morning was kind of showing off. I was checking out some articles about Dead Horse Bay and they have lots of pictures of the bottles along the shore. When we were there, I only saw a few and mostly just broken pieces along the shore. I was thinking most of these items were dragged back to the sea during superstorm Sandy. In addition, it was already high tide when we got there and most of the bottles were covered by the water. When the waves come you could almost hear a tinkling sound as the bottles move with the current. There is a tree in Dead Horse Bay where some people hang bottles. Sometimes there are a lot of bottles hanging but on the day of our visit, there were only a few moving like windchimes. We finally left the place close to noontime as we still had to cover a lot of places. Along the way back we passed by remnants of a pier. And this looked like the ruins of a boat. At one point my attention was caught by some sea gulls, it must be feeding time! Further on is another ship ruin, the pieces have stuck on what looked like hardened tar. We then continued to proceed to the next part of our walk, Floyd Bennett Field. 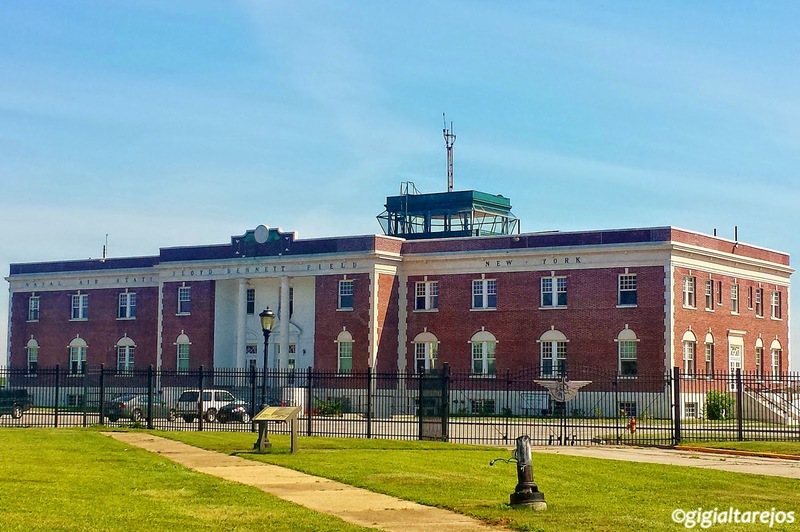 The former airport is located across Dead Horse Bay, with Flatbush Avenue dissecting the area which ultimately leads to the Marine Parkway Bridge. We passed underneath the bridge to go to Floyd Bennett Field. The area by the Marine Parkway Bridge has been known to be a great fishing spot. This angler must have been feeling hot that summer day. Well, whatever it takes just to land the big one! Did you enjoy our trip to Dead Horse Bay? Floyd Bennett Field was our second stop and we ended the day in the Jamaica Bay Wildlife Sanctuary. I hope to share with you all these adventures in my next blog. Here's one last pic, a panorama taken from Dead Horse Bay. Enjoy! And a map of the area ..